Originally from Chicago, Ken Karlic is a national award-winning artist and paints with a sense of urgency and passion that is more about capturing the essence of a subject rather than the specifics. 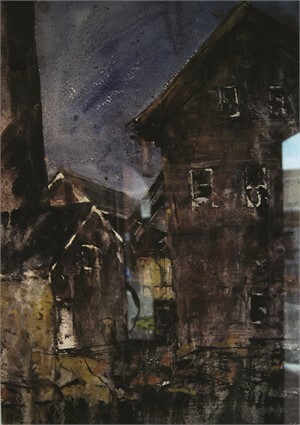 Ken is represented by several galleries, exhibits regularly and participates in national juried plein air competitions. He is featured in the September 2017 issue of the international magazine, The Art of Watercolour, and the October/November 2017 issue of PleinAir Magazine. Ken is a featured artist with Daniel Smith Watercolors, and published, Sophisticated Chaos with DANIEL SMITH Watercolors, Step by Step Painting Large Scale for Daniel Smith Art Materials, which was distributed to their global community of professional artists, retailers and distributors. “GAF on Ponca” appears in the December 1 2017 Featured Artist and December 6 2017 Editorial sections of PleinAir Today. Ken Karlic studied architecture, painting and graphic design at the University of Illinois in Urbana-Champaign and received a BFA. He is a founding partner of the graphic design firm Splice Design Group in Baltimore MD, an instructor at Chesapeake Fine Art Studio in Stevensville MD and teaches workshops nationally. 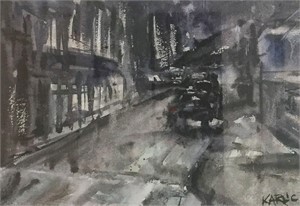 Ken is a member of the Mid-Atlantic Plein-Air Painters Association (MAPAPA), a Signature Artist Member of Baltimore Watercolor Society, a member of InLiquid in Philadelphia and a Signature Artist Member of Noyes Museum of Art at Stockton University in New Jersey. Ken Karlic Originally from Chicago, Ken Karlic is a national award-winning artist and paints with a sense of urgency and passion that is more about capturing the essence of a subject rather than the specifics. 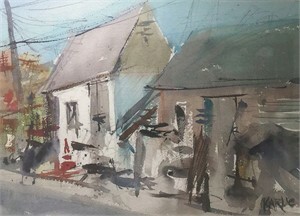 Ken is represented by several galleries, exhibits regularly and participates in national juried plein air competitions. 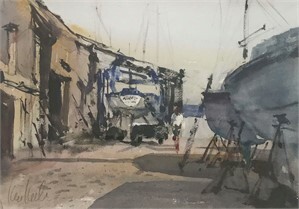 He is featured in the September 2017 issue of the international magazine, The Art of Watercolour, and the October/November 2017 issue of PleinAir Magazine. 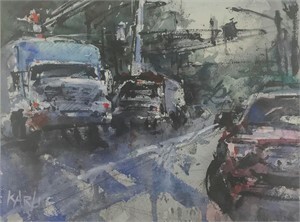 Ken is a featured artist with Daniel Smith Watercolors, and published, Sophisticated Chaos with DANIEL SMITH Watercolors, Step by Step Painting Large Scale for Daniel Smith Art Materials, which was distributed to their global community of professional artists, retailers and distributors. “GAF on Ponca” appears in the December 1 2017 Featured Artist and December 6 2017 Editorial sections of PleinAir Today. Ken Karlic studied architecture, painting and graphic design at the University of Illinois in Urbana-Champaign and received a BFA. He is a founding partner of the graphic design firm Splice Design Group in Baltimore MD, an instructor at Chesapeake Fine Art Studio in Stevensville MD and teaches workshops nationally. 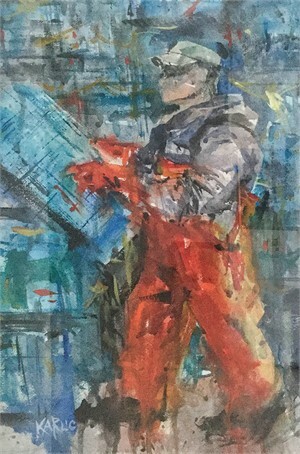 Ken is a member of the Mid-Atlantic Plein-Air Painters Association (MAPAPA), a Signature Artist Member of Baltimore Watercolor Society, a member of InLiquid in Philadelphia and a Signature Artist Member of Noyes Museum of Art at Stockton University in New Jersey.